Stretch marks develop when the skin stretches or shrinks quickly, most commonly from rapid gain or loss of weight. The abrupt change causes the collagen and elastin, which support our skin, to rupture, creating tears in the underlying structure and scarring the skin by causing unattractive pink, reddish or purplish streaks as the skin heals. These may fade over time, but will never disappear completely. Stretch marks can be worsened by hormonal changes associated with puberty, pregnancy, bodybuilding, hormone replacement therapy, or other changes in hormone levels. Before stretch marks begin to emerge, the skin can appear thin and slightly pink, causing it to feel somewhat irritated or itchy. The marks initially develop as wrinkly, raised streaks that can be red, purple, pink, reddish-brown or dark brown, depending on an individual’ s skin colour. These streaks eventually fade and flatten over time, and tend to become silvery in colour. Pregnancy, puberty, and rapid weight gain or loss can all cause stretch marks. Our Icon™1540 Fractional Non-Ablative Resurfacing Laser can achieve impressive results both on new stretch marks that are still reddish or dark in colour, as well as on older stretch marks. The 1540 Fractional Non-Ablative Resurfacing Laser is more powerful than other lasers of its kind, delivering greater energy per micro-beam and a greater depth of penetration (up to 1 mm). This deep penetration can promote a more significant response in the skin, resulting in more effective and longer-lasting results. Light is delivered to the skin through an array of high-precision microbeams that penetrate deep into the dermis the skin to target and remove damaged skin cells, without touching the surrounding healthy, untreated skin. This stimulates the natural healing process and renews healthy skin cells. Since the Icon™ 1540 delivers fractionated light, the treatments are safer, with consistent results, and ensure increased patient comfort and faster healing time. Fractional Laser Skin Resurfacing works to repair stretch marks, as well as to fade their surface colour. While there is no treatment that will completely remove all stretch marks, Fractional Laser Skin Resurfacing can result in a 50 to 75% improvement in the appearance of stretch marks. For optimal results, 3 to 5 sessions spaced every 2 months are recommended, with full results occurring 3 to 4 months after the last treatment. Microneedle therapy (also referred as Skin Needling or Collagen Induction Therapy) is one of the most innovative and effective skin treatments available. Microneedling is intended to significantly improve many skin conditions, including stretch marks. The concept of skin needling is based on the skin’s natural ability to repair itself whenever it encounters physical damage such as cuts, burns or other abrasions. Immediately after an injury occurs, our body reuses the damaged collagen and elastin fibers to produce new ones. Skin needling enables controlled induction of the skin’s self-repair mechanism by using very fine needles to puncture the skin and create micro “injuries” in the skin. This triggers new collagen synthesis, while protecting the top layer of skin and posing no risk of permanent scarring. 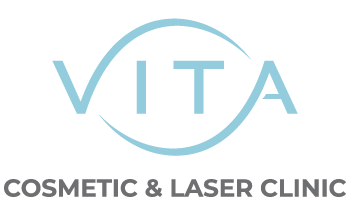 At VITA Cosmetic and Laser Clinic we use a variety of medical grade microneedling devices designed for use by aesthetic medical professionals to treat melasma (skin discoloration), acne scars and surgical scars.